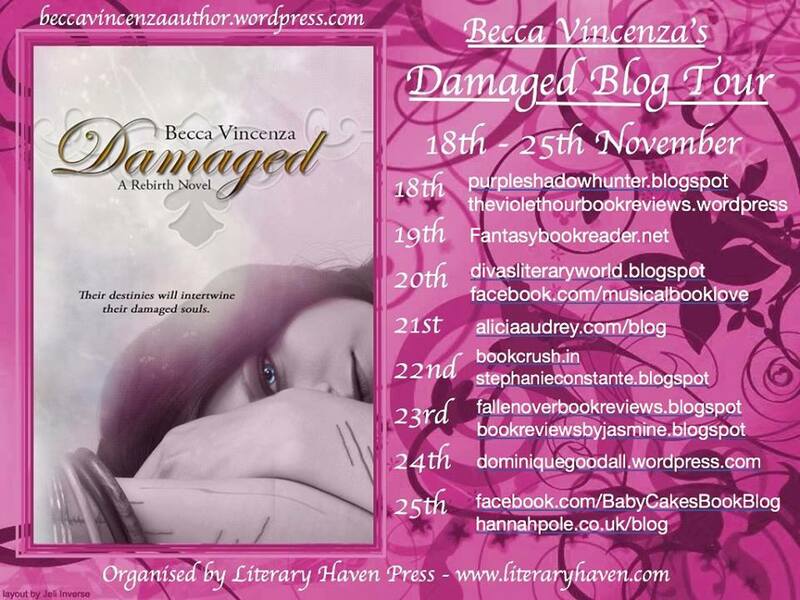 So the promotional blog tour of Damaged starts today! I am so thrilled, and so excited so many blogs signed up to do this with me. I can’t even begin to thank them enough. A HUGE HUGE HUGE HUGE thank you to my partner and one of my best friends Hannah Pole. She is such a peach for allowing this to be our first real trial run at a blog tour. I couldn’t be more thrilled. This is such an amazing opportunity for me. I know I don’t have a lot of followers, and I know that I pushed back the date release on my book, but I am so glad for the people who have been supporting me this whole way through. I love you guys so much you are all wonderful and I am hoping Damaged lives up to your expectations. And to thank you and the bloggers helping me out I am offering up two ARC copies of Damaged in a rafflecopter. I hope you check out each day along the tour as each day will have a different teaser banner. Okay so AHHHHHHHHHHHHHH I am going on TOUR! Yup you read that right I am going on TOUR! And we are doing a bit of a sample tour is what we are calling it right now. So its a week long fun times, of a spotlight post, ARC giveaway and yeah. So that was one bit of news. So yay! Thats really all I suppose. Soooo I wrote a piece of prose just because. And I wanted to share it so… enjoy. It’s hard. I am trapped. I am screaming. Screaming. Screaming. Screaming. You can’t hear it. And that is okay. No matter how close you are, you will never hear it. I cry. I plead, but I am voiceless. Inside this body I call home do I find myself the most lost. Here I wish I could escape. I don’t feel eyes on me, never that. No. I feel the lack of looks. The totally ignorance of my being. Those who see me tell me all the time the lines. The lines, the lies. I know they care. I know they mean well. Being alone has become my worst enemy. My sanctuary gone and destroyed by my own insecurities. I sit in the ruins and hope that in time I can rebuild. For now I scream. For now I cry. For now I plead. To be trapped here. To be trapped in my own mind. Never allowed and escape. To never be allowed that slight bit of freedom. A weight I carry. A weight that will not leave me. Here I plea. Here I writher. Here I have broken dreams. Don’t cry for me. Don’t try to save me. My freedom comes at a cost. My cage is of my own making. And yet I remained trapped. I can feel freedom all around me. I can touch the breeze, but nothing will save me. Soooo, I don’t know if people are actually that closely following this book or anything, but there is something that I am sad to post but it must be done. Damaged might…possibly…be …releasedalittlelate – and if you can’t read all scrunched lettering: Damaged might be released a little later than I excepted. I was really thrilled to be thinking that I could get it out by the end of the year but the way things are going right now, and with holidays coming up – me being a college student – exams and some very terrifying things I don’t want to think about but must start thinking about is all around the same time, while still working my part time job…well hopefully it won’t take me too long to get edits done but we shall see. Not to bad considering I probably wasn’t going to release until the end of December.